I began word study this year by giving a rather daunting survey to determine morphological and etymological understandings of my current grade 7 class. My hope is that students will be able to see growth in their understanding throughout the year. I began by explaining that these were linguistic terms that help us to be precise when discussing words. They are the terms we will be using throughout the year and rather than learning a list of definitions, students will be constantly exposed to the terms until they find themselves embedding this terminology into their written and spoken discourse about words! At least this is the dream. Initial information from the survey indicated that only a few of the terms are familiar. Some students have been exposed to the terms prefix, suffix and a few to the term of ‘base element’. I have provided a glossary of the terms for students to consult on our class website. We began our plunge into the world of morphology and etymology briefly touching on the word <mortals>. 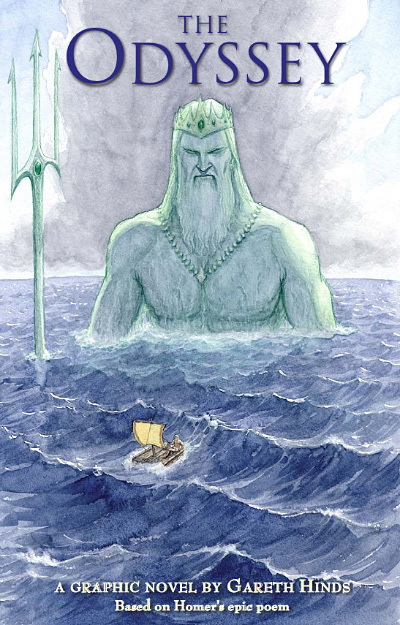 Many of the students understand the meaning but as we are studying Gareth Hinds’s graphic novel interpretation of The Odyssey, and today viewing a documentary on the god Zeus, we began word study with <mortals> and <immortals>. I hoped in this 10 minute study we could touch on and exemplify essential terms such as affixes: prefix and suffixes, base element – bound and free and root. We then considered the morphology of <mortals>, analyzing it into its elements: no prefix, bound base element <mort>, suffixes <-al> and <-s>. I briefly explained that that suffixes indicate how a word is used, the grammatical slot it occupies in a sentence. Students recognized that the <-s> in <mortals> indicated that the word was plural noun. We saw how <-al> can be used both adjectivally and when examining the word <immortals> that the prefix<im-> has a negative sense ‘not’. We established the morphological representation for <immortals> as <im+mort+al+s>. We then stood up and spelled out the elements: ‘<im->’ (pause, hands up to indicate the morphemic boundary between the prefix and base element) then ‘<mort>’ (pause, hands up), ‘<-al>’ (pause, hands up) <-s>. Lots of laughter plus an explanation that we stored morphemes in our brain and pausing at morphemic boundaries helps us bring to the foreground what we unconsciously recognize. This knowledge of orthographic morphemes is critical in constructing the word in writing. Students enjoy the kinesthetic (and for us dramatic ) aspect of ‘spelling out’ to indicate the structure of a word through which their concept of morphemes is deepened. We also briefly explored related words when I asked if students could find any words sharing the same base element:<mort>. Students quickly recognized mortality, immortality, mortify, mortifying, mortification while I recorded on the whiteboard their discoveries in a hastily sketched matrix (see Real Spelling) to hold our conjectures. I explained that<fy> was not a suffix , but a bound base element coming from Latin facere to make or to do, hence mortify, literally ‘to make dead’ … interesting denotation in the dictionary which I will revisit with the students later. I was tempted at this point to drift into exploring the Latin root facere and the resulting bases in modern English. Really interesting! However, this root will resurface, and I, rather pleased by my self restraint, avoided dumping a lorry load of information on students to crush their initial enthusiasm to a state of torpor. Then onto the documentary and the immortal Zeus. I was left wondering about the word <deathless> adjectival so would need to be referring to another word or implying another word. <immortal> and <deathless> similar or different connotations? Synonymous? Interesting to compare at a later stage… my hunch is of Old English origins. So perhaps later to explore the difference between the two words. suffixes can only be preceded by a base or another suffix. I also wanted to begin the process of establishing the difference between the concepts of a base and root. In much of my reading, the term ‘root’ is ambiguous and I follow the advice of Real Spelling to reserve the term root as an etymological term while the term base element is morphological.Thus in our investigation :<mort> is the bound base element from the Latin root mori: to die. We will return to this base … didn’t get to:mortuary, mortician, moribund and the wonderful perhaps not frequently used pnigomortia-death by choking! And then there are all the euphemisms for death … We will definitely watch Palin and Cleese’s comic classic below, discuss euphemism and consider the mortality of the poor Norwegian Blue!